Texas is home to many excellent coin and precious metal bullion dealers. In Houston, you’ll find coin shops both in the city center and in the suburbs, specializing in rare historical coins and in bullion for precious metal investment. Keep in mind that in Texas, there is sales tax on 8.25% on purchases of coins and bullion unless the total purchase price is at least $1,000, in which case the sale is exempt from the tax. If the purchase includes U.S. coins, the face value of the U.S. coins may be substracted from the sales price when determining taxes owed. Because of these regulations, when buying silver from a Houston coin shop, it is best to buy at least $1,000 in coins at a time, or focus on U.S. coins and bullion, in order to avoid the tax. 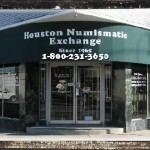 Houston Numismatic Exchange is the best-known Houston silver dealer. 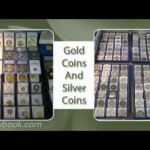 They deal in ancient coins, rare coins, bullion, and currency, along with fine jewelry and sportscards. The shop also offers an unusual variety of jewelry made of coins. Founded in 1965, this is the largest gold and silver dealer in Texas, as well as one of the oldest. They buy and sell all major types of coins and bullion, carry a large selection at low prices, and welcome both new and experienced collectors. Their storefront is set up for browsing, so come on in and check out what’s new. 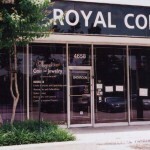 Royal Coin and Jewelry specializes in U.S. and foreign coin collections, bullion, and precious metal scrap. In particular, Royal Coin stocks a wide range of PCGS and NGC certified coins, proof and mint sets, and Republic of Texas and Confederate currency that you won’t find in other Texas coin shops. This coin dealer also buys and sells estate jewelry, sterling flatware, and scrap silver and offers free 15 minute verbal appraisals. If you prefer to find your coins in the ground, Royal Coin is also a Tesoro Authorized metal detector dealer. Buy silver in Houston or browse the latest selection online. Located in Bellaire, to the east of Houston’s city center, Collectors Coin Shop offers some of the rarest and most valuable U.S. and foreign coins. Collectors Coin Shop has a knowledgeable staff ready to serve customers looking for a safe and rewarding investment, whether they are interested in rare coins or gold bullion.